MORE than £6million of Solihull taxpayers’ money reserved for replenishing council housing stock has been wasted in five years, say opposition councillors. New figures obtained by Green party councillors have revealed that, between 2012 and this year, Solihull council has failed to spend over £6.2 million available for building council houses to replace those sold under the Right to Buy scheme. 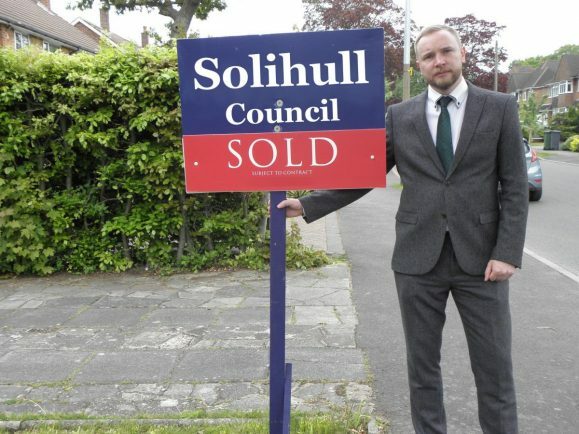 The Greens, the official opposition on Solihull Metropolitan Borough Council, report that in the last five years, council housing tenants bought 294 houses, for £15.4 million. The statistics show the council sent back 40 per cent of money from these Right-to-Buy sales to central government. According to the Greens, if the council does not build new houses to replace those sold within a three-year timescale, the council is legally bound to return the money to central government, losing it permanently. The news comes at a time of housing shortages, and long waiting lists for council housing in Solihull. Solihull Green Party councillor Max McLoughlin said: “This is a scandalous waste of Solihull money. “Solihull is the most unaffordable place to live in the West Midlands, with many people struggling to find anywhere to live at all, particularly the least well-off. The Green party provided figures that show Solihull had 20,000 council houses in 1980. That figure had dropped to 12,500 in the year 2000 and had fallen to below 10,000 by last year. As we reported last week, a new report compiled by homeless charity Shelter showed homelessness has risen by 22 per cent in Solihull and the West Midlands. This equates to 1 in 314 people in Solihull who are homeless. The failure to rebuild social houses also comes a year after Shelter produced a report naming Solihull as among the most unaffordable place to live in the West Midlands. Around 7000 applications (affecting over 12,000 people) are on the waiting list for social housing. Over 1000 of those cases are categorised as having the most exceptional need of suitable housing. They include people who are officially homeless or have a disability. Coun Alison Rolf, cabinet portfolio holder for environment and housing, responded by saying: “The Government allows the Council to retain a proportion of receipts from right to buy properties to be used to repay debt outstanding on the houses sold. Later she added: “An amount of RTB receipts has to be paid back to government. The amount that has to be paid to government is set in statute and cannot be varied by any local authority. “The total amount paid back to government for the last 5 years is just over £6 million. She continued: “The Council retains a proportion of RTB receipts, some of which can be used to repay outstanding debt on the RTB properties sold. “However, the Council has chosen not to repay the debt and will instead use the receipts to replenish the housing stock. “Coincidentally, the amount that will be used to replenish the stock rather than repaying debt is also £6 million. She concluded her remarks stating: “There are some smaller value RTB receipts retained by the Council that have to be spent within 3 years or be returned to government (£109,000 to be spent in 2017/18). “None of these amounts have been returned to government in the current or previous years.